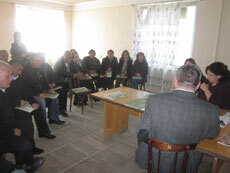 On March 27, 2014, in the framework of the project “Clean Up Georgia – Raising of Public Awareness and Involvement in Solid Waste Management Improvement” (Phase II), Greens movement of Georgia/ Friends of the Earth Georgia held a meeting in 2 villages of Kareli municipality, village Ruisi and village Urbnisi, with the participation of the representatives of local population, village trustees and Council members of Kareli municipality. 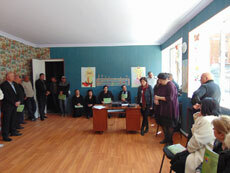 On March 27, 2014, in the framework of the project “Clean Up Georgia – Raising of Public Awareness and Involvement in Solid Waste Management Improvement” (Phase II), Greens movement of Georgia/ Friends of the Earth Georgia held a meeting in Kkashuri municipality, with representatives of local population and Gamgeoba. 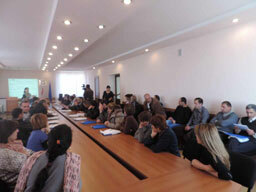 On March 26, 2014, in the framework of the project “Clean Up Georgia – Raising of Public Awareness and Involvement in Solid Waste Management Improvement ” (Phase II), Georgian Society of Nature Explorers “Orchis” arranged a Meeting in Akhalkalaki Municipality with the participation of the representatives of Akhalkalaki Municipality Sakrebulo and Gamgeoba, Local Authorities, LTDs and others. On March 26, 2014, in the framework of the project “Clean Up Georgia – Raising of Public Awareness and Involvement in Solid Waste Management Improvement ” (Phase II), Georgian Society of Nature Explorers “Orchis” arranged a Meeting in Ninotsminda Municipality with the participation of the representatives of Ninotsminda Municipality Sakrebulo and Gamgeoba, Local Authorities, mass media and others. 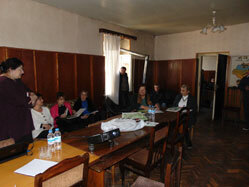 On March 26, 2014, in the framework of the project “Clean Up Georgia – Raising of Public Awareness and Involvement in Solid Waste Management Improvement” (Phase II), Greens movement of Georgia/ Friends of the Earth Georgia held a meeting in Signagi municipality, town Tsnori, with the participation of the representatives of local population. An information package on waste management related issues has been distributed among the participants The aim of the meeting was to address priority issues with regards of waste management in rural areas. 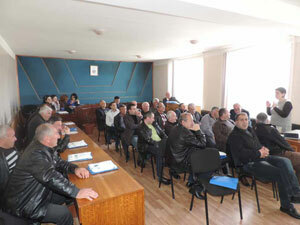 On March 25, in the framework of the project «Clean Up Georgia - to increase public awareness and participation in the improvement of solid waste" (Phase II), Greens Movement of Georgia / Friends of the Earth - Georgia organized a meeting in Gurjaani municipality, village Velistsikhe, with the participation of the representatives of local population, village trustee as well as the trustees of neighboring villages. In total 20 activists. On March 25, in the framework of the project «Clean Up Georgia - to increase public awareness and participation in the improvement of solid waste" (Phase II), Greens Movement of Georgia / Friends of the Earth - Georgia organized a meeting in Gurjaani municipality, village Chalaubani. Meeting was attended by village Trustee, local residents, as well as district Gamgebeli.In total 20 activists. On March 22, the Water Resources Protection Day, in the framework of the project «Clean Up Georgia - to increase public awareness and participation in the improvement of solid waste" (Phase II) a clean up action took place in Guria District. . Event has been held on the organization of a regional representative Greens Movement of Georgia / Friends of the Earth – Georgia and with the help of the Regional Governor Mr. Giorgi Chkhaidze. Heads of the Councils and Chief Executives (Gamgebeli) of Chokhtauri, Lanchkhuti and Ozurgeti municipalities took part in the action. 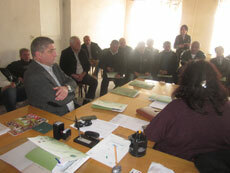 With the help of Chief Executives (Gamgebeli) of the Municipalities the meetings were held with Village Trustees. Number of clean up actions in the villages have been planned for the future. On March 22, the Water Resources protection Day, within the framework of the project "Clean-up Georgia ", a clean up action was held in village Puti. During the event, the entrance to the village and banks of small flow of so -called “Putura” were cleaned up. Along with organizers 10 pupils of village public school also took part. On March 22, the Day of Water Resources Protection , a clean up action “Blue Stream” was held in Kvareli Within the framework of the campaign Gremi Archangel Church and river Bolia surrounding areas were cleaned up, approximately 1.5 ha. 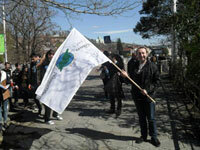 March 22, on the occasion of the International Water Resources Protection Day, in the framework of the project “Clean up Georgia” a clean up action was carried out in Senaki municipality, with participation of the representatives of “Ecoclub”, founded on the initiative of regional representation of Greens Movement of Georgia and unite 9-12 grade students of Senaki public schools. 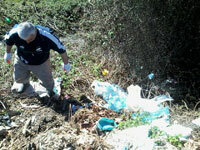 During the action, shorelines of river Tsivi and Zanadzga were cleaned up. The action was held under the auspices of the campaign "Blue Stream". March 22, within the framework of the project «Clean Up Georgia - to increase public awareness and participation in the improvement of solid waste" (Phase II) on Water Resources Protection Day a clean up action has been organized by regional representation of Greens Movement of Georgia / Friends of the Earth – Georgia. During the action the delta of river Chorokhi has been cleaned up. 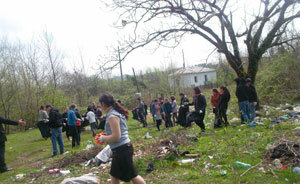 On March 22, Water Resources Protection Day, in the framework of the project «Clean Up Georgia” a clean up action took place in town Kutaisi. Event was carried under the organization of Kutaisi Greens, with participation of the representatives of regional administration and city municipal authorities, Tsereteli State University students and volunteers, in total 120 people.